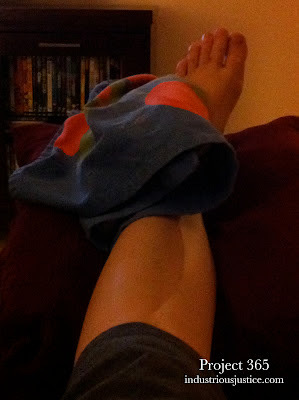 My only major injury to date (*knock on wood*) has been a sprained ankle. For some unknown reason, my ankle decided to puff up on Tuesday -- for the first time since it initially healed five years ago. I took this photo while trying to ice it back to a normal looking ankle. (We were out of frozen peas so I went with frozen broccoli.) It has puffed up every day since, starting fairly normal in the morning but then getting worse as the day goes on. I am thinking I will have to go to the doctor if it doesn't stop doing that soon.